The InCyt I/P-2TM Imaging System includes everything needed for calcium and other ratiometric fluorophore experiments. 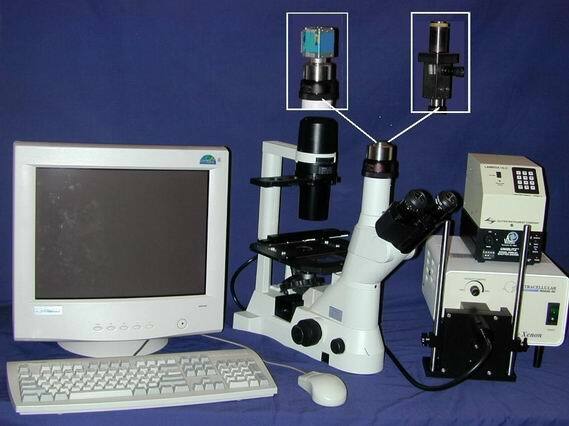 The system includes: an inverted epi-fluorescence/phase contrast microscope, microphotometer assembly, low-light level integrating CCD camera, computer controlled filter changer, Xenon UV/VIS arc lamp, image processing computer and data acquisition/analysis software. The InCyt I/P-2TM Imaging System was designed in a biomedical research laboratory by scientists for scientists. Menu selection appears in the sequence in which experiments are performed. Esoteric options that add complexity and are rarely used have been eliminated from the menus. The software follows standard Windows graphical-user-interface-protocol. The hardware has been tested for reliability and ruggedness, as well as, simplicity of set up and operation. New users can learn to use the system and be doing their first experiment in a few hours. Imaging data can be measured continuously on as many as 50 preselected regions of interest. The results can displayed in real time or images can be saved for post hoc analysis. Saved images can be played back as an animated sequence?ideal for analysis of subcellular responses, intercellular communication and heterogeneity among the individual cells in a population. Ion concentration within cells can be converted to color using standard or custom pseudocolor tables. Image sequences can be presented as a montage with user-defined annotation for presentation and publication. Data generated by InCyt I/P-2TM are stored in a standard TIFF format and data files are stored as ASCII text. 300 watt Xenon arc lamp for both UV and visible light excitation. (1) Graph ion concentration in each cell during experiment. Works with hundreds of fluorescent dyes for measuring: Ca2+, pH, Na+, K+, Mg+2, H2O2, cyclic ADP Ribose, etc.